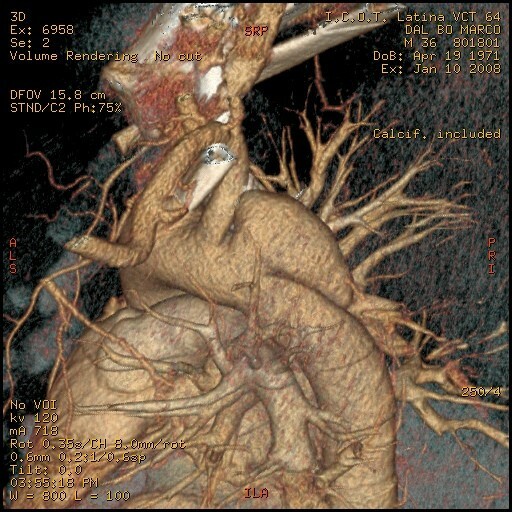 This article details a case report of a traumatic aortic arch false aneurysm after blunt chest trauma. Thoracic aorta false aneurysms are a rare and life-threatening complication of aortic surgery, infection, genetic disorders and trauma. Thoracic aorta false aneurysms are a rare and life-threatening complication of aortic surgery, infection, genetic disorders and trauma. After trauma approximately 2% to 5% of patients with aortic disruption develop a false aneurysm either after non operative treatment or lack of diagnosis . Little is known about the natural history of this complication. However, a perfused false aneurysm may partially clot and organize with a fibrous wall potentially evolving into a saccular or fusiform aneurysm; late enlargement and even rupture may occur. Ninety percent of the false aneurysms involve the aortic isthmus; this probably reflects a sort of protection by the mediastinal periadventitial tissues at this level [2, 3]. Patients developing chronic pseudoaneurysms show a low rate of associated injuries at the time of trauma [2, 3]; in fact, 35% present no other injuries, and 50% only one. A 33 year-old male motocross rider came to our attention complaining of back chest pain and cough. He referred a history of chest trauma 4 years ago during a motorbike race. The trauma resulted in an exstensive left shoulder and head injury associated to multiple rib fractures. He spent one month in hospital; he subsequently improved and was discharged in stable conditions. However, he continued to complain of a progressively increasing chest pain. At chest x-ray a left upper mediastinal mass was detected. 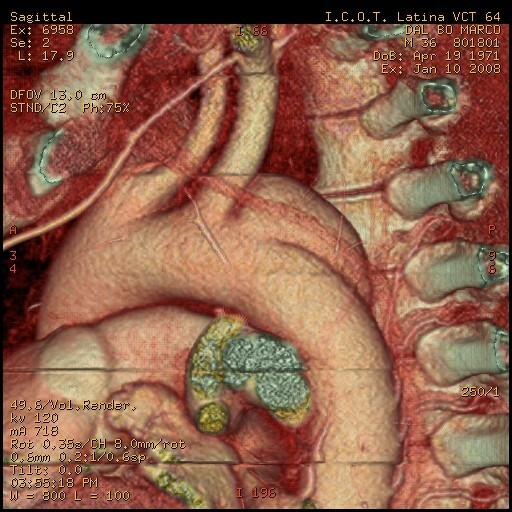 A 64 multislice CT scan showed the presence of an aortic aneurysm (4 cm × 4.5 cm) arising from the descending thoracic aorta (Fig 1, 2, 3); the neck was located immediately after the origin of the left subclavian artery. on the convex aspect of the vessel. 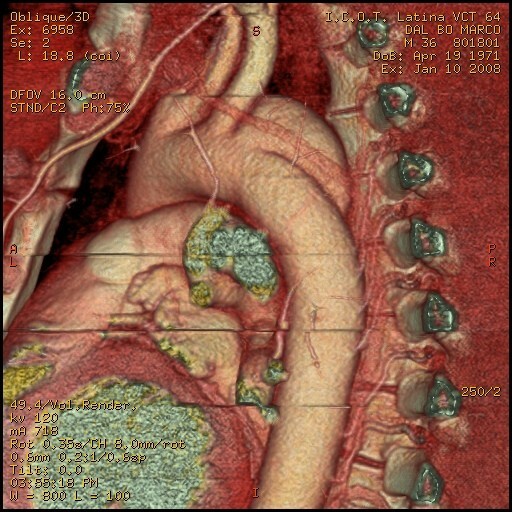 CT also showed the presence of a bovine configuration of the aorta. The diagnosis was "post-traumatic false aneurysm" involving the distal arch, as in most of the cases. The patient underwent endograft placement and fully recovered. pseudoaneurysm and its relationship with surrounding structures. pseudoaneurysm and its relationship with vertebral spine. pseudoaneurysm and its relationship with subclavian artery.